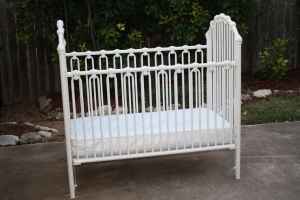 Does anyone know of a place where I can buy replacement metal crib parts for a used baby crib that is about 4 years old that is made of white metal. The baby bed has a cracked plastic rail glide on the drop side and I can't find the correct replacement parts to fit it. I tried buying the broken guide from a company online but the part that they sent me is the wrong size. The drop side that I want is a round tube that sits in the guide, not a rectangle shaped tube like the one they had for sale. Go Here to See More The additional problem that I am facing is that I can't seem to find any label or other indication of the model or brand even though I have looked in all the usual places where model numbers are usually stamped or displayed. It is in great shape, but I think the plastic guides cheapens it, whereas I know Bratt uses all metal crib parts. Perhaps high end nursery furniture manufacturers make all of their hardware out of metal. If I can't find the correct metal crib replacement parts, I wouldn't mind using a stationary guide that will keep the rail up permanently. I hate to get rid of the crib, as it's so beautiful but I just don't know how to fix it or what to do about finding out the name and brand of the baby bed. If you know something about the metal baby crib that you see in the picture on this page or if you have any suggestions for a resource that carries metal crib parts, please post the brand that you believe the bed to be or contact me using the space below (and PLEASE include your contact information in case I need to get in touch with you!). Unique Baby Gear Ideas encourages our visitors to share their resources for baby crib replacement parts, alert us to crib recalls of metal cribs and to consider writing reviews of your baby's bed to make our little community of expectant parents aware of any problems that are associated with different models and brands. Anyone have success story about this crib and finding parts? This is a Simmons Monaco crib. We bought a Monaco for our baby's nursery new back in 2009. The one that we purchased did not come with a drop side at that time. Here is some information on the Simmons Monaco Convertible Crib. 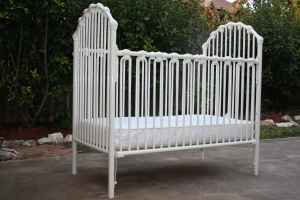 This crib has an Antique Silver finish and an all-metal frame. The crib's mattress support has helical springs and metal fabric. I'm not sure exactly what they mean by "metal fabric". I have this same exact crib. Bought it secondhand as well, and didn't know the maker until I stumbled upon the matching changing table. The maker for this crib is Simmons Juvenile Furniture. Corsican replied to me today telling me that this was in fact NOT their crib. I don't have the original paperwork....does anyone else have their paperwork so I can send a pic of it to Corsican? Corsican JC Penney Crib - Parts?????? Ok......so I contacted http://www.yuweicribrecalls.com/ and they said they mailed out the kit for me to immobilize the drop down side. After two weeks I emailed back and told them I never received it. They quickly responded and told me that it was NOT their crib and they did NOT make parts for it. So I have been trying to contact Corsican for a few weeks with NO luck. I desperately need to immobilize this drop side bc we are just a few weeks away from getting a foster baby. Help someone!!!!! The crib was recalled, but you can get an immobilizer kit from the company to secure the gate side. I left a message with them today, as well as emailed them for the kit. Curious to see if they will get back with me. The manufacturer seems to be Yu Wei Cribs. Mom of 7......soon to be 8! I also have this crib and can't figure out the manufacturer! Did the kit you found work??? My mother purchased this crib 5 years ago for her house. I now have an infant and would like to use this crib...did you ever find out who made this crib. I need to get the recall kit! Unfortunately JCPenney could not help me, but I went digging around Google for some information and what I learned was that these types of cribs are actually no longer legal to be manufactured due to health and safety hazards. they will send you FREE replacement parts to immobilize the drop down side. This is the company I contacted 4 years ago for replacement parts. If you visit this website you will see the crib in the picture at the top of the website. The pieces to fix the crib only come in black, so I will be painting mine when they come in. However, I'm so happy to have found this information, and I am happy that I can share it with everyone here! I own this same crib!!! I purchased this crib in 2006 brand new, and in 2008 I needed to purchase replacement parts for it, and when I contacted JcPenney's they gave me the name and address of the company which was not that address I found listed on these comments. I had written this information down, but given the fact that I've since moved, and it's been so many years I only remember the manufacturer was in Plano, TX (and the parts were only like 3 bucks!). I really wish I could find this information, so I contacted JcPenney again, and over the 1800 number the girl said there was nothing she could do (but I think they just didnt want to help), so since I had the crib shipped to a local store at the time, I contacted them, and the girl took all the information I had and my name and number, and said they'd do some digging to figure out what they could find for me and get back to me. I'm hoping they can find the information!!! If I get the address I will post the address of the company. mendi can you help me? did you ever find out the who makes your crib?....I believe I have the exact crib which I also purchased at a yard sale. Thank you Danielle for checking on this for me! The Corsican crib is very similar but mine doesn't have a few of the features the Corsican has. Like the feet of the crib and the swirl at the head or foot of the crib. Also, I can see that there are bolts holding the crib rails in a stationary way, so all these things tell me that I don't think this is the same crib, but thank you for looking and I am still open to suggestions.